Let’s Stay Together follows the lives of a group of five young, ambitious African American as they make their way through life and love. BET is hoping that viewers remain interested in their lives and bring in strong ratings. Will the show be cancelled or renewed for another season? Stay tuned! Let’s Stay Together typically airs on Tuesday nights. 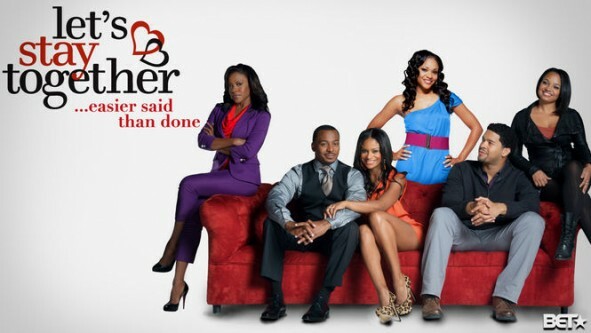 The show’s cast includes Bert Belasco, Erica Hubbard, Joyful Drake, Kyla Pratt, Nadine Ellis, and RonReaco Lee. Below are the show’s ratings, typically the best way to tell if it will be cancelled or renewed for another season. UPDATE: The series is expected to return for a fourth season in early 2014. 0.6 demo rating (-14% change) with 1.22 million (-13% change). Season averages: 0.69 in the demo with 1.39 million. 0.7 demo rating (0% change) with 1.40 million (+11% change). Season averages: 0.70 in the demo with 1.42 million. 0.7 demo rating (0% change) with 1.25 million (-16% change). 0.7 demo rating (+17% change) with 1.49 million (+26% change). Season averages: 0.70 in the demo with 1.44 million. 0.6 demo rating (-14% change) with 1.18 million (-23% change). 0.7 demo rating (0% change) with 1.53 million (+20% change). Season averages: 0.72 in the demo with 1.50 million. 0.7 demo rating (+17% change) with 1.28 million (-2% change). Season averages: 0.73 in the demo with 1.49 million. UPDATE: BET has renewed Let’s Stay Together for a fourth season. 0.6 demo rating (-33% change) with 1.31 million (-31% change). Season averages: 0.75 in the demo with 1.60 million. 0.9 rating in the 18-49 demographic with 1.88 million total viewers. Season average: 0.90 in the demo with 1.88 million. What do you think? Do you still like Let’s Stay Together TV series? Are you hoping that it’s renewed for another season? Do these stats include internet, Netflix, Amazon, and Hulu Plus viewers? I wonder if they including these streams the numbers would be better. bet doesnt promotw this show AT ALLLL.